The best cross-country ski area in Sleeping Bear Dunes National Lakeshore is Alligator Hill, whose 8.3-mile trail system offers skiers three loops that range from easy to advance and feature plenty of long downhill runs and equally long climbs. But during the rest of the year Alligator Hill can be a destination for anybody looking for a walk in the woods amid a hilly one - that includes the kind of sweeping Lake Michigan panorama this national park is famous for. 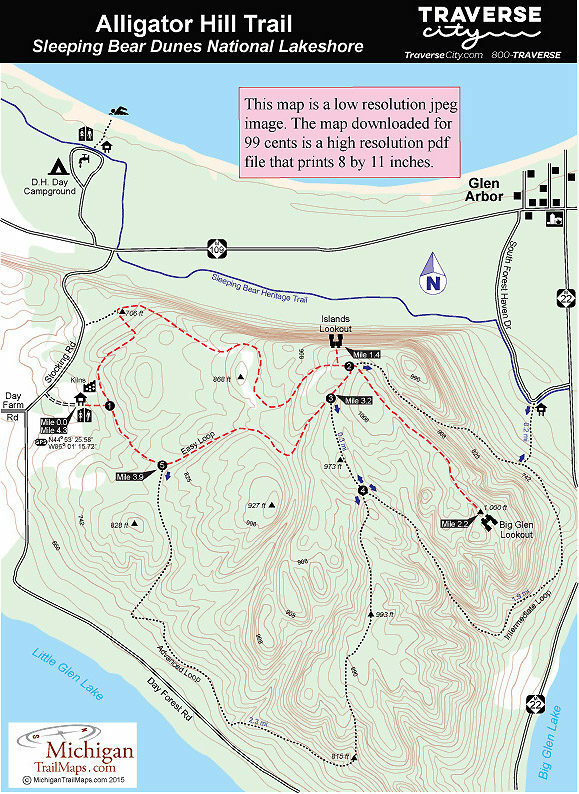 The best cross-country ski area in Sleeping Bear Dunes National Lakeshore is Alligator Hill, whose 8.3-mile trail system offers skiers three loops that range from easy to advance and feature plenty of long downhill runs and equally long climbs. 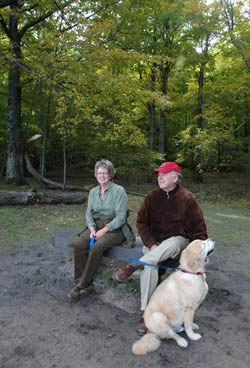 But during the rest of the year Alligator Hill can be a destination for anybody looking for a walk in the woods – amid a hilly one - that includes the kind of sweeping Lake Michigan panorama this national park is famous for. The hill picks up its name from a long ridge and bluff at its southeast corner that resembles the silhouette of an alligator’s snout, best seen from the top of the Dune Climb. Alligator Hill is the result of glacial activity when two lobes of ice that gouged out Big Glen Lake and Little Glen Lake dumped their load of sand and rock between them. An ancient Lake Michigan, that was much higher than today’s Great Lake, went on to erode bluffs and cut terraces and notches on the flank of the hill, including the alligator’s snout. The most unusual aspect of Alligator Hill is the remains of an 18-hole golf course on its north side. The course dates back to the 1920s when David Henry Day, a prominent lumber baron who was responsible for the company town of Glen Haven, developed an elaborate resort that included golfing. The venture failed during the Great Depression but you can still see the outlines of fairways today from aerial and satellite photos such as those found on Google Earth. The trails that wind up and down Alligator Hill are wide, well-marked paths that are used by Nordic skiers, day hikers and equestrians as this is the only area of the lakeshore where horses are allowed. Mountain bikes are not allowed on the trails, however. Other than to increase the mileage, the Advanced Loop and Intermediate Loop hold little interest to most hikers. 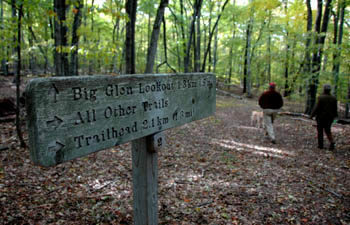 Thus the walk described is the Easy Loop along with the spur to Big Glen Lookout for a 4.3-mile day. Although the trek is rated moderate, be prepared for a steady uphill climb in the first half. Just beyond the trailhead are the concrete kilns that lumberman Pierce Stocking built in the 1950s before he built his famous road. Stocking had purchased the area from D.H. Day in 1948 and used the kilns to turn scrap wood into charcoal that he bagged and sold throughout Michigan. Post No. 1 is quickly reached and you head north (left) to reach post No. 2. You pass through one of the old fairways, though it’s hard to distinguish from the ground, then in 0.3 mile swing east and begin a steady climb along a wide trail that is a former road bed. It’s a gentle ascent through the beech-maple forest but it lasts for a half mile before the trail swings away from the edge of the ridge at Mile 1. At Mile 1.4 you arrive at the posted Islands Overlook, a short walk from the main trail. 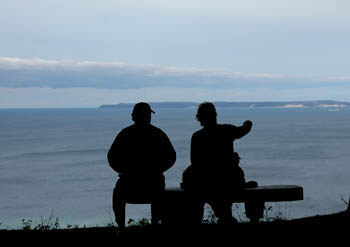 A bench is located at the edge of the bluff so you can plop down to gather in the spectacular view. Below you a forest stretches north to the sandy Lake Michigan shoreline while floating on a watery horizon are North and South Manitou Islands and Beaver Island. On a clear day you might even see South Fox Island and at any time a freighter might be passing through the Manitou Passage. In the fall this magnificent view will framed in by shades of autumn. Post No. 2 is just up the main trail and clearly points out the spur to Big Glen Lookout. This segment is something of a relief for some hikers as it is a wide and level path along the crest of a ridge. At the end the spur becomes narrow and is marked by blue blazes just before you arrive at the overlook and another bench. Needless to say this view is not nearly as spectacular as Islands Overlook as you can see only a small portion of Big Glen Lake and the ridges that enclosed to the east. You backtrack to post No. 2, reached at Mile 3 of the hike, and then head west (left), gently descending to post No. 3 within a quarter mile. Head for post No. 5 as the descent becomes even more mellow and within 0.3 mile levels out. Post No. 5 is reached at Mile 3.9 and the remaining 0.4 mile resumes its gentle descent through the beech-maple forest almost all the way back to the parking lot. There is a small parking area with a display sign, map box and a vault toilet. The trail is open year-round and all visitors are required to have a weekly vehicle entrance permit, an annual park pass or a per-person pass if they arrive on foot, bicycle or motorcycle. Passes can be purchased from the Philip Hart Visitor Center in Empire. From M-109, just east of the entrance of D.H. Day Campground, head south on Stocking Road. The trailhead will be reached in 0.75 mile.